Opponents of the €100 household charge might find some support from recently published figures which show that central government has agreed to absorb over €110m of loans taken out by local authorities up-and-down the country to fund local boom-time developments. The information is provided in a letter from Minister Phil Hogan’s Department of the Environment, Community and Local Government to the Committee of Public Accounts on 12th September 2012, which has just now been published on the Oireachtas website. With the collapse of the property market and the economy in 2008, the value of the property underpinning local authority loans also collapsed, and with a general oversupply of residential property from years of over-construction, these local lands are now unlikely to be developed. In 2010, the Fianna Fail/Green government introduced the so-called “Land Aggregation Scheme”**, which allowed local authorities to transfer both the loans and the land to a new state-owned body called the “Housing and Sustainable Communities Agency Ltd”. In that way, local authorities wiped their hands clean of what were often poor buying decisions during the boom. And nationally, we have shouldered the burden of these mistakes, as it is central government that pays off these loans on property which is no longer worth the amount outstanding on the loans. The information released by Minister Hogan’s department shows that to date, €110.4m of loans – includes outstanding principal and interest – has been absorbed by the nation. With €26.5m of loans, Fingal County Council has transferred the most. However it seems that most local authorities HAVEN’T transferred loans, so nationally it seems we are funding the mistakes of some parts of the country but not others. The list of loans absorbed to date is shown below. You can see a full list of the loans that the scheme was intended to absorb together with the names of the people from whom the local authorities bought the land here. 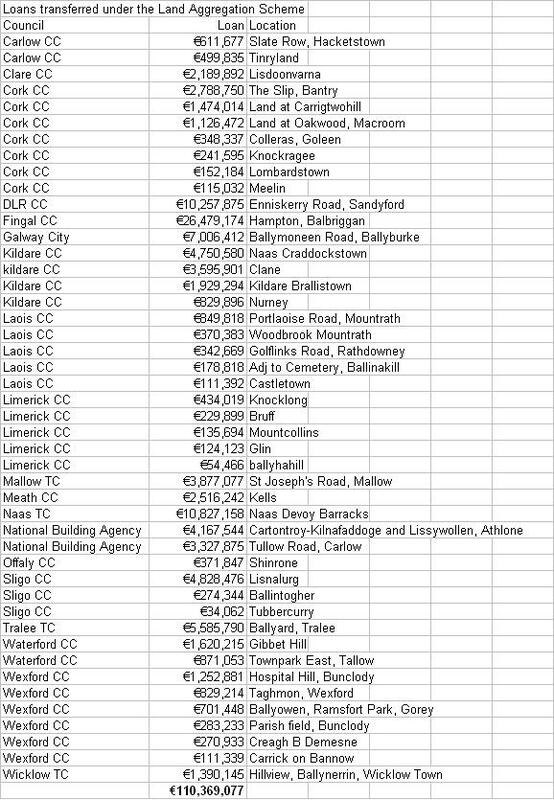 So the next time you hear a Government politician telling you that the household charge is necessary to pay for local authority services in your area, you can take the statement with a pinch of salt because the national government has shown that it funds local authorities – it has to date absolved them of €110m of boom-time property loans. Though on the other hand, you might also sympathise with the fact that we have a €13bn annual deficit and our lenders demanded we introduce a property charge as part of the bailout so regardless of who funds local authorities, we do need close the budget and have some sort of property tax. ** Overview of the Scheme (from Department of Environment, Community and Local Government Briefing Note). In order to alleviate the financial burden on local authorities in servicing land loans, the scheme was developed for land owned by a local authority in respect of which outstanding loans with the Housing Finance Agency (HFA) have fallen due for payment. The Land Aggregation Scheme provides that a local authority may transfer lands, acquired for housing purposes on which outstanding HFA loans are redeemed, to Housing and Sustainable Communities Ltd. (HSC Ltd). This transfer of land is subject to approval from DECLG on the basis that the local authority has no short to medium term plans for the development of the land. The local authority redeems the loan from the HFA in advance of transferring the land. Funding to redeem the loan is made available by DECLG, subject to the availability of that funding. There is no onus on a local authority to take part in the scheme but it can be of benefit to those local authorities who are servicing land loans where the land in question will not be developed in the short to medium term. HSC Ltd. is responsible for the management and maintenance of lands transferred under the scheme. There is full consultation with local authorities in regard to any future proposals for use of the lands. The lands may be utilised for social housing or other appropriate public uses with the approval of DECLG. Following transfer of the land, HSC Ltd. is required to prepare a report and implement a strategy for the management, utilisation and ultimate development of the land in question. HSC Ltd. seeks input from the relevant local authority and other interested bodies in respect of the land in question when preparing the report. Although NAMA might be paying 168 developers to manage their own property, in today’s edition of Iris Oifigiuil we see the other side of the coin as NAMA has receivers appointed to 11 companies, of which eight are new companies which have not been subject to NAMA foreclosure action before. 10 of the 11 companies are part of Michael Whelan’s Moritz group, one company shown at the end is entirely separate. NAMA has already had receivers appointed to some companies in the Moritz group and there is on-going litigation in Dublin’s High Court where Moritz is being represented by another NAMA developer, Noel Smyth. Remember you can see a comprehensive list of Irish foreclosure action by NAMA here and in this regularly updated spreadsheet. This information is already in the public domain but until now hasn’t been available online. It is correspondence which evidences the salaries paid to NAMA developers and it has just now been published by the Oireachtas Committee of Public Accounts, commonly called the PAC. It is correspondence received by the PAC in July from NAMA’s Martin Whelan – he’s the former CIF communications chief who was recruited as NAMA’s Relationship Manager in January 2012, though he seems to have recently acquired a bit of an empire and his title has become Head of Relationship Management. His job is to maintain good relations with politicians – NAMA recently refused in a parliamentary question to say how much the Relationship Department at NAMA was costing (us! ), citing data protection – no, seriously! 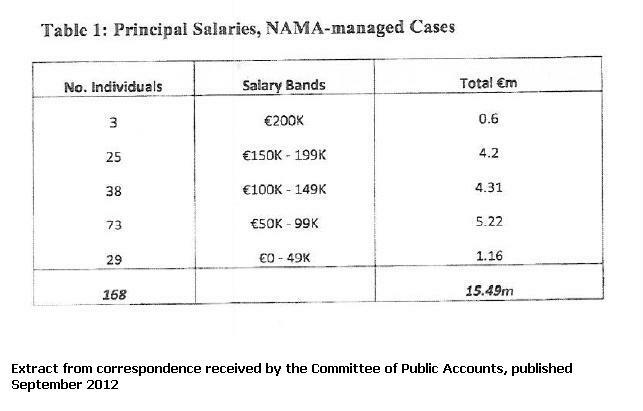 The correspondence shows the gross salaries drawn by developers – referred to as “principals” by NAMA. The most eye-catching figures will be the three developers getting €200,000 a year. NAMA won’t disclose their identities but two of the three are believed to be Ballymore’s Sean Mulryan, the man behind large residential developments in London and Castlethorn’s Joe O’Reilly, the developer of the Dundrum Town Centre shopping complex. The identity of the third has attracted less speculation, though I would not be surprised if it was a certain Northern Irish developer and racehorse owner. In total there are 168 developers getting an overall total of €15.49m per annum – an average of €92,200. Of course this information is misleading, and possibly completely misleading. I would be willing to wager that neither Sean Mulryan nor Joe O’Reilly would get out of bed in the morning for €200,000 a year. But the possibility of a profit share from the eventual sale of assets just might pique their interest, and there could well be hundreds of millions of euro on offer from NAMA in that regard, but NAMA doesn’t like talking about this. And it should be remembered that whilst these developers may be working on NAMA-related assets, they may also be working for Certus/BoSI-related assets or indeed new ventures. I am pretty sure very few of the developers on €0-49,000-a-year – the average is €43,000 – are working full-time on NAMA assets. In other words, they may be part-timers, but again NAMA is not likely to be keen to discuss this aspect. As is usual when developer salaries and rewards are discussed, the conversation tends to turn to value for money, and if developers who are unable to repay their loans are the best people for NAMA to employ. NAMA says that hiring developers is cheaper than the alternative of property or share receivers who in Ireland tend to charge around €200 per hour and €800 per hour respectively. They will not be as familiar with the projects as the original developers and as we saw recently in the Ivan Yates case at the High Court, receivers can get bonuses on top of their basic. If you feel tempted to vent ill-feeling on the subject, this previous blogpost on developers’ salaries might add another dimension to your feelings. NAMA has a commitment under the NAMA Act “to contribute to the social and economic development of the State” and we saw at the end of 2011, the announcement by Minister for the Environment, Community and Local Government, Phil Hogan announce that NAMA was to provide 2,000 homes for social housing. NAMA clarified this by saying the homes would be provided on arms-length commercial basis, but with 98,000 families on the housing waiting list representing nearly 200,000 citizens, the Minister’s announcement was welcomed. Nearly ten months later, and how are we doing with progress? In the Dail last week the Sinn Fein finance spokesperson Pearse Doherty together with Sinn Fein’s agriculture spokesman Michael Colreavy and Fianna Fail’s environment spokesman Barry Cowen all asked the junior minister at the Department of the Environment, Community and Local Government Jan O’Sullivan for a progress update. What is the latest? The full questions and answer are shown below but this extracts the data and once you get past the bluster about identifying, examining, negotiating, considering, it emerges that just two homes have in fact been sold by NAMA this year for social housing. (15) And 58 of these were sold to Cluid housing association in the summer of…..2011! So let’s get this straight, since Minister Hogan’s fanfare announcement in December 2011 of 2,000 homes being provided by NAMA, to the end of August 2012 compared with December 2011, an overall total of TWO homes have in fact been sold by NAMA for social housing, and a further 34 are being rented. Now on this occasion, it seems as if NAMA has held up its side of the bargain and found 3,700 homes from its 13,200 Irish homes portfolio which might be suitable for social housing, and it has engaged with Department and with housing authorities. NAMA is keen to sell and would relish the boost to its embattled reputation to have a few social housing sales concluded. So why has there been practically no progress in eight months of 2012. Perhaps the €147,000 a year “super” Minister of State for Housing and Planning, Jan O’Sullivan can answer that one – she’s one of the two “super” junior ministers along with Paul Kehoe who get an extra €17,205 on top of their junior ministerial premium of €37,370 on top of their TD salary of €92,672. *SPV, Olivia Kelly at the Irish Times – this didn’t warrant a NAMA press release – reported in August 2012 that NAMA had set NAMA Asset Residential Property Services Limited on 18th July 2012 with the aim of speeding up the sale of homes for social housing. Deputy Pearse Doherty: To ask the Minister for the Environment, Community and Local Government if he or his Department have engaged in an discussions or negotiations with the National Asset Management Agency to act on their requirement to provide a social dividend by releasing properties for social housing to the ownership of local authorities. Deputy Michael Colreavy: To ask the Minister for the Environment, Community and Local Government if he will provide an update on the delivery of the promised 2,000 units from the National Assets Management Agency portfolio; and the details of the method through which they will be paid. Deputy Barry Cowen: To ask the Minister for the Environment, Community and Local Government the discussions he has held with the National Assets Management Agency regarding social housing lists in relation to procuring suitable housing stock to tackle social housing lists. ; and if he will make a statement on the matter. Minister of State at the Department of Environment, Community and Local Government, Jan O’Sullivan: I propose to take Question Nos. 51, 63 and 1115 together. Over the past 12 months both Minister Hogan and I have met with NAMA to discuss the provision of properties for social housing. Since the announcement in December 2011 that NAMA would commit to providing units for social housing by the end of 2012, a Steering Group comprising my Department, the Housing Agency and NAMA have been working together with housing authorities and approved housing bodies (AHBs) towards achieving this objective. Progress to date in delivering units for social housing purposes has been slow. In the main this is due to the complexities of getting agreement from multiple parties operating within an environment subject to a range of legal and financial constraints. I hope that the recent establishment by NAMA of a Special Purpose Vehicle, to facilitate the leasing of units, will ensure speedier delivery on the commitment. Notwithstanding the difficulties encountered, NAMA have identified over 3,700 units to be considered for social housing. Of those that have been examined to date, 438 have been deemed unsuitable by housing authorities. A further 542 have been withdrawn, usually by property owners as circumstances change e.g. units have been sold or let privately and are no longer available. Another 1,246 units are for examination by housing authorities as to their suitability for social housing purposes. At present demand has been confirmed for over 1,500 units which are currently being processed. Of the 1,500 units, 391 are currently under negotiation with relevant parties (i.e. AHB’s, housing authorities, NAMA, receivers, property owners etc.). A further 167 are under active consideration for acquisition by the Special Purpose Vehicle. To the end of August 2012, 118 housing units have been provided from the portfolio of units identified by NAMA. 94 of these units are for social housing purposes. Of these units 34 are funded under leasing arrangements with the balance of units delivered funded through the local authority social housing capital investment programme or by AHB’s under the Capital Assistance Scheme.